At Windo VanGo serving Baltimore, when we meet new customers, we’re often asked how to know when it’s time to get new treatments. The answer isn’t necessarily simple—it can depend on a lot of factors, from whether the old treatments are operating correctly to whether you like the look or style of them. If it’s been a while since you last got new treatments, it might be time to call in the professionals. Speak with one of our representatives today—we’ll be happy to help you with all of your window fashions needs. UV rays can be harmful, and older blinds and shades can be susceptible to damage such as cracking, warping, fading, and yellowing. Today’s more efficient models feature great UV protection that helps keep them being damaged. Consider Hunter Douglas Palm Beach™ Polysatin™ Shutters and Everwood® Alternative Wood Blinds, which are both guaranteed not to warp or yellow. As they get older, blinds or shades can begin to not operate properly. Some can be repaired; however, if they can’t, it might be time for a replacement. 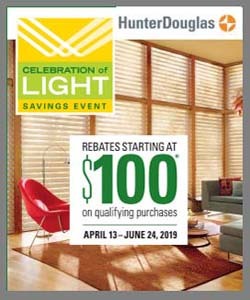 Hunter Douglas Window Fashions offer the most comprehensive collection blinds, shades, and shutters available today. Corded window treatments can present a choking hazard to small children and pets. If you have corded window treatments, consider replacing them with a cordless option such as the Hunter Douglas LiteRise™ operating system. Or choose Hunter Douglas PowerView® Motorization, which lets you operate your blinds or shades remotely, even when you aren’t home. One reason to get new treatments is to improve the energy efficiency at your window. If your current treatments were off the shelf or if the style you have just doesn’t help with controlling heat coming in or escaping from your window, it might be time to upgrade to a model that will give you something in return. Consider Duette® Honeycomb Shades, which have some of the best energy efficiency on the market. They’re stylish and functional, and they’ll practically pay for themselves in the savings you’ll see in your energy bills.